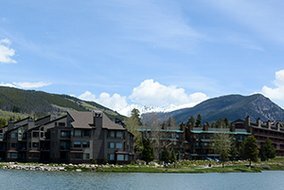 You can drive from Breckenridge to Copper Mountain. You can also hike or bike from one to the other and that is one of the many reasons homeowners love Summit County. The Wheeler Trail starts on the south side near the highest peak in the county crossing several ridge before it arrives at the Breckenridge Ski Resort. The ski area encompasses Peak 10, 9, 8 and 7 of the Tenmile Range, and slipping across the ridge, you can see Copper Mountain on the other side. From Peak 8, the Peaks Trail begins and connects Breckenridge and Frisco. This relatively gentle rolling path is a favorite of mountain bikers, runners and cross-country skiers..
Down in the valleys, a paved bike path connects all the ski resorts and Summit's mountain towns. Silverthorne's bikeway is paved to the north as far as there are homes, and circumnavigating Lake Dillon is a common ride. Summit County appeals to more than hikers and bikers, with great fly-fishing, white water rafting and of course, skiing. Within its 600 sq. 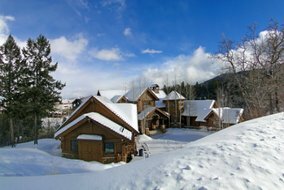 miles are four ski resorts: Breckenridge, Arapaho Basin, Keystone and Copper Mountain, and five Nordic ski centers. And five separate golf courses. 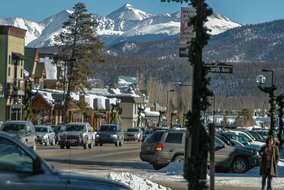 Charming boutique shops along Main Street Breckenridge provide necessities, local flavors and world-class luxury. From Frisco's BBQ Challenge, Keystone's jazz, Breckenridge's film fests and International Snow Sculpture Championship, and lots of live music in Copper, Summit County comes together as a community with culture and history. 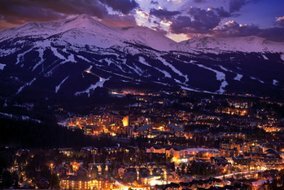 A resort and world-renown vacation destination, Breckenridge, Colorado - really, all of Summit County - is one of best places to call home. And your independent realtors at Breckenridge Associates Real Estate are ready to help you find a home amid it all. Please feel free to call us toll-free at 800-774-7970, or locally 970-453-2200.